Look beneath the shiny products, services and experiences of the world’s best brands and you’ll find the true source of their competitive advantage. It’s not company culture, although that’s also very important. It’s something far more esoteric: their business ecosystem. It’s well known that Etsy has created a “virtuous circle” between its buyers and sellers. Buyers get unique, handmade items and the benefit of supporting independent crafters. Sellers get a huge market of buyers and a wide variety of different services to help them sell even more effectively. However, what’s less obvious is that Etsy has significantly extended this circle— its business ecosystem—in recent years to create even more value for both sides. Through its Craft Entrepreneurship Program, Etsy is working with local governments and nonprofits to train crafters in lower-income neighborhoods to become Etsy sellers. Through a partnership with TaskRabbit, Etsy provides sellers access to labor for fulfilling larger orders. Through Etsy Manufacturing, Etsy is linking successful sellers with small, local manufacturers to help with even larger orders. What’s brilliant about each of these programs is that they are multi-sided relationships where all parties benefit. But Etsy didn’t stop there. Through Etsy Local, buyers can find Etsy merchandise available in their area and even connect with sellers who are showing at markets and fairs. Through Etsy Wholesale, Etsy sellers can get connected to independent retailers for distribution through their stores. Through Etsy at Nordstrom and other retail partnerships, select Etsy sellers can get retail distribution at large national stores. In sum, Etsy has built an incredibly powerful network of supply and demand-side partners who are bound together by a rich, complex and mutually beneficial value exchange. For example, through selling Etsy merchandise, Nordstrom can also lay claim to impacting job creation for the underserved; TaskRabbit can go beyond chores and offer people the opportunity to make things that will be sold at West Elm. Like all networks, value scales exponentially, but unlike most networks, the value in Etsy’s business ecosystem is much more evenly shared. Because the icing is Etsy’s purpose: to reimagine commerce in ways that build a more fulfilling and lasting world. 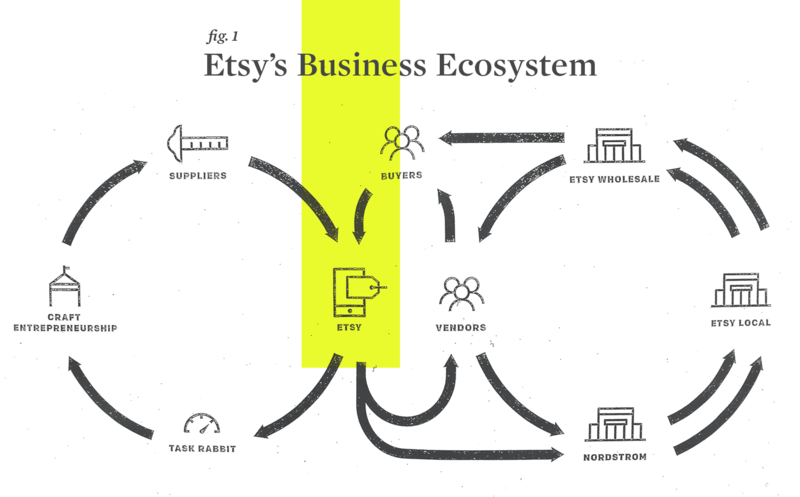 It’s this purpose that turns Etsy’s ecosystem from a transactional business arrangement, into one that puts all stakeholders on the same page in pursuit of the same goal. It’s the purpose that brings authenticity to all of the participants and makes Etsy’s ecosystem both intellectually smart and emotionally inspiring. This ecosystem makes Etsy incredibly attractive to all parties and makes it extremely difficult for Amazon or anyone else to unseat them. Etsy’s user experience and design can be copied, but its business ecosystem is very hard for anyone to duplicate. The good news is that almost any brand can design their own business ecosystem as consciously as Etsy did. Through our work with a number of clients, we’ve developed a series of tools that can help you get started. In posts to come, we’ll share tools you can apply to better understand how any business ecosystem operates.